How does the right to asylum work in Europe? Why is the right to asylum in Europe not functioning properly? Why are the solutions proposed so far ineffective? How can we reform the European asylum policy? Ongoing population movements, the Aquarius crisis and other dramatic events in the Mediterranean, strong national reactions, frequent confusions between migrants and refugees… Since 2015, migration issues have been at the forefront of public debate across Europe. In 2015, almost 1.4 million asylum applications were filed in Europe. 1.2 million were filed in 2016. While the flow of migrants has decreased since then, this crisis revealed the inadequacies of European legal tools in terms of asylum and, by extension, in terms of managing migration flows. The right to asylum in the EU is in danger. In this context, Institut Montaigne and the French progressive independent think tank Terra Nova call for a reform of the European asylum policy and for a rapid, unified response to the humanitarian emergency in the Mediterranean. "Our shared obligation is to combine humanism and realism, dignity and effectiveness, as much as possible, so that we can reject a perverse political game where constant promises of severity – and even of closing of our borders – cause in reality widespread disorder and an insidious disavowal of responsibility. A more rational approach and a bit of political courage will correct the problems identified in our report.” – Authors of the report “Saving the Right to Asylum"
and Jean-François Rial, CEO of Voyageurs du Monde and member of Terra Nova and Institut Montaigne. The Geneva Convention of 1951 is the foundation of the right to asylum in Europe. All EU Member States signed and ratified it. Article 67, paragraph 2 of the Treaty on the Functioning of the European Union (TFEU) stipulates that the EU "develops a common policy on asylum, immigration, and external border control that is based on solidarity between Member States." In practice, Member States are free to set up their own administrative procedures to examine asylum applications and grant the asylum status. In France, the French Office for the Protection of Refugees and the Stateless (OFPRA) is in charge of this process. In Germany, the Bundesamt für Migration und Flüchtlinge (BAMF) holds this responsibility. In 1985, several European countries decided to open their internal borders and thus to strengthen their external borders. This is called the Schengen area. To do this, States had to coordinate at the European level to plan for the allocation of asylum seekers and refugees. The Dublin Regulation, which has been revised several times, is in charge of this distribution. In particular, it stipulates that the European country of initial entry of an asylum seeker is in charge of examining the latter’s application. Although all EU Member States ratified the Geneva Convention, there are great disparities in the granting of the right to asylum among the 27 European countries. This rate varies greatly between countries, and is also unstable within a single country over time. For instance, in the case of Afghan asylum seekers in Germany, the rejection rate climbed from 27% in 2015 to 53% in 2017. In all, 61% of asylum applications filed in 2017 in the 28 EU countries were accepted. However, the rejection rate for applications can reach 90% in Hungary, while it is only 30% in the Netherlands or Germany. This situation clearly shows that there is a true "asylum lottery" in Europe. By virtue of the Dublin Regulation and due to the current migratory routes, the burden of receiving and examining asylum applications currently weighs very heavily on Greece, Malta and Italy. The exposure of EU countries to the flow of migrants varies according to their geographical location. International law requires them to rescue migrants and open their harbors. The Geneva Convention then obliges them to examine the potential asylum applications of those rescued. The Dublin Regulation prevents them from transferring the examination of these applications to other Member States and obliges them to welcome the migrants that certain EU countries send back to them. All these regulations contribute to imposing the burden of controlling the EU’s external borders and examining asylum applications upon front-line countries. This contradicts the spirit of solidarity that should prevail within the EU. Currently, there is no judicial mechanism for a burden sharing regarding asylum applicants in case of a crisis. The 2015 migration crisis has had political consequences throughout Europe. 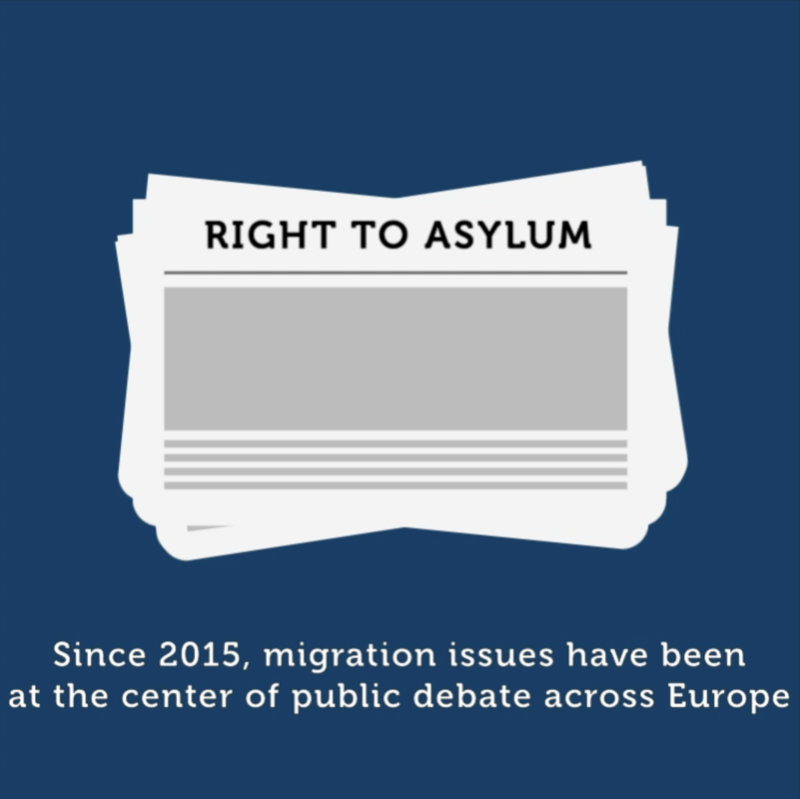 Several proposals to reform the asylum system were presented by Member States or European institutions to break this stalemate. These can be classified into two categories. Italian Prime Minister Giuseppe Conte, who heads a populist coalition government, proposed a series of measures in 2018 aiming to strengthen external EU border controls. According to him, reducing the upstream flow of migrants — i.e. the number of migrants entering EU territory — will allow us to reduce the downstream flow and thus the "secondary movements" between EU countries.. Similarly, in March 2016, the EU reached an agreement with Turkey compelling the latter to prevent illegal entries from its territory into the EU in exchange for financial support (€3 billion for 2016 and 2017, and the same amount for 2018 and 2019). In February 2017, the EU also agreed to disburse €200 million to help Libya, in particular to allow the country to better equip its coast guard. Likewise, in 2016, the European Commission proposed to implement a new regulation requiring Member States to preliminarily assess the admissibility of asylum applications before beginning the examination process. Applications from people who stayed in a "safe third-party country" before reaching the EU would be rejected. Can we externalize the care of migrants who want to reach our territory to third-party countries — sometimes in appalling conditions — even though some of them would be eligible for protection in Europe? Are these viable long-term solutions? Some countries could soon be overwhelmed with arriving migrants. Moreover, not all countries will manage to control their borders as tightly as Turkey does. Can we distort the spirit of the Geneva Convention to this extent? UNHCR recently recalled that, by virtue of article 35 of the Convention, "asylum cannot be refused simply on the grounds that it could have been requested in another State." Is it viable for Europe to be so dependent? Turkey's demands are already increasing. In 2015, faced with a record influx of migrants in EU territory, the European Commission proposed to the Council that a temporary mechanism be established in order to relocate asylum seekers in various Member States based on an automatic and binding system. The latter was meant to relocate 160,000 people present in Italy, Greece, and Hungary "who clearly need international protection." The Council later approved this proposal for 120,000 people present in Italy and Greece. In May 2018, the Commission published an assessment of the implementation of this system indicating that only 35% of the migrants were relocated. This can partially be explained by certain countries’ refusal to implement this plan, with Hungary and Poland having relocated no migrants at all. In 2017, the Commission launched infringement proceedings against these countries and Slovakia for non-compliance with the Council's conclusions. Faced with this deadlock and given the urgency of the situation, it is critical to reform the European asylum system. Since 2015, Member States have struggled to agree on a solution to the refugee crisis. The EU is facing a toxic dilemma. Front-line countries see the Dublin Regulation as a form of coercion that overwhelmingly concentrates the flow of migrants on them. Second-line countries cling on to this regulation as a guarantee ensuring both that front-line countries are held responsible for managing their borders, and that a sort of internal border is established between them and Mediterranean countries. In order to prevent any political interference, each Member State will have to transform their national authority in charge of asylum applications into an independent agency. The clause in the Dublin Regulation of the country of first entry should be eliminated, allowing each asylum seeker to request protection from the State of his or her choice, while prohibiting multiple applications. Finally, an Office for the Right to Asylum in Europe (ORAE) should be established, in order to coordinate these national agencies and gradually harmonize their decision-making criteria. In order to respond to any crisis, the ORAE, assisted by a committee of representatives from national authorities, will have the responsibility of reallocating cases to be processed among Member States, and of ensuring an equitable distribution of efforts to resettle refugees in European States, based on their population, GDP per capita and unemployment rate. It is essential to strengthen the EU’s role in the procedures for the removal of rejected asylum-seekers by using the resources of Frontex, and, in close cooperation with Member States, in order to negotiate readmission agreements with countries of origin. Regarding countries of transit, this would make it easier to conclude partnership agreements to ensure migrants are welcomed in a way that is respectful of human dignity, to establish training and orientation programs, and to make asylum seekers’ path to Europe safer (resettlement procedure with UNHCR). Asylum seekers should be able to have access to employment three months at the latest after filing an application. In order to facilitate their integration, it is essential to improve the coordination of the work done by social workers, volunteers, and government offices. Finally, refugees should receive the right of residence and settlement in any Member State - an essential freedom in the EU - without being able to transfer the social benefits associated with the status of refugee, applicable only in the original country granting protection. The EU must bear most of the costs the asylum policy in Europe involves, especially those linked to the European Receiving and Processing Centers (ERPCs) (see focus no.6 below) and to procedures for sending rejected asylum-seekers back to their countries of origin. Member States that refuse to participate in the reallocation mechanisms will be financially penalized and, if necessary, the most willing States will be able to decide to combine their asylum policies in a strengthened cooperative framework or through ad hoc agreements. In order to respond to the current emergency situation, European Receiving and Processing Centers (ERPCs) should be created in EU countries on the Mediterranean coast, so that the asylum applications of those rescued at sea be processed in very short time frames. People who are taken care of on site will be able to request asylum in the Member State of their choice, subject to possible equalizations (see focus no.2 above). In each ERPC, offices of the various national authorities will handle the asylum applications of people present, as well as the transfer of those receiving protection to the Member State that has granted it. Dans un rapport publié jeudi, Terra Nova et l’Institut Montaigne préconisent notamment la fin de la règle du traitement de l’asile par le premier pays d’entrée.